Long (picture above) attended our Children’s Church for several years when he was younger. 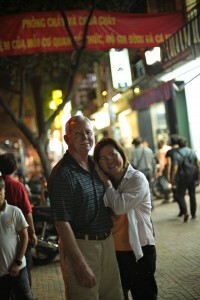 About 4 years ago Long’s mother found work in another town and they moved away from Binh Chau. We lost all contact with both Long and his mother. About 3 weeks ago we were surprised and happy when Long showed up at Children’s Church. As we talked with Long he shared with us his journey of the last 4 years, which speaks of God’s love, mercy, and grace for Long. The town they moved to had no Christian church and his mother worked long hours leaving Long by himself a lot of the time. Without much supervision/guidance, Long dropped out of school during 6th grade. When he was 13 Long left for Saigon in hopes of finding his father, whom he hadn’t seen in years. After getting off the bus, Long was looking around trying to decide what to do next when a man approached him. The man asked him if he was looking for someone and Long gave him the name of his father. The man then told Long he knew his father and could take Long to him. Long was so excited. The man asked Long if he was hungry and Long said yes. The man then said let’s stop at this restaurant I know and get some pho soup before I take you to your father. When they arrived at the restaurant Long was taken to the back of the restaurant. For the next 3 months Long was imprisoned, forced to work for no pay, and beaten on a regular basis. He and other children were kept in the back of the restaurant to clean, wash dishes, etc. Long and the other children were so frightened of the beatings that they obeyed what they were told to do. Then, one day, God literally opened a door and Long escaped. He ran as fast and as far as he could from the restaurant. Then Long spotted a policeman and ran to him. After telling his story to the policeman, Long was taken to the police headquarters. With the information Long provided them, the police raided the restaurant. They arrested the owners and freed 17-18 other children being held captive there. We praise God for, not only rescuing Long, but using him to help free all these other children from this horrible situation. Since then Long has gone from factory job to job lying about his age, but eventually being fired when they find out he’s only 15. This brought him back to his mother, but she works as a live in maid so he is not able to stay with her. Long decided to come to Binh Chau to possibly stay with a cousin. 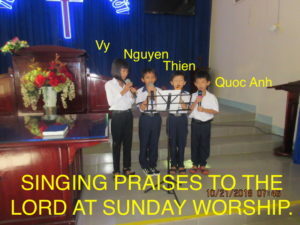 As the bus passed the Binh Chau Church, Longsaid a warm feeling came over him as he remembered all the love he felt when he attended Children’s Church. Long got off the bus and came to the church wondering if we would even remember him. As he was embraced and welcomed, first by Mai, and then the rest of us, Long said he was so happy to be back “home”. The past few days Long has been staying at the church and doing little jobs around the church property. Please pray God will give us wisdom/discernment as to how we might help Long going forward. Vy is doing great and is turning into a little evangelist. She befriended 2 girls in her class, told them about Jesus, asked them if they would like a Bible, and took them one when they said yes. 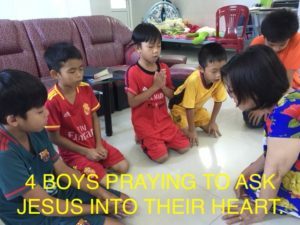 Quoc Anh is doing well, but with 2 other boys around his age new to the orphanage/love house, they can be a little challenging at times. But God is definitely working in their lives. 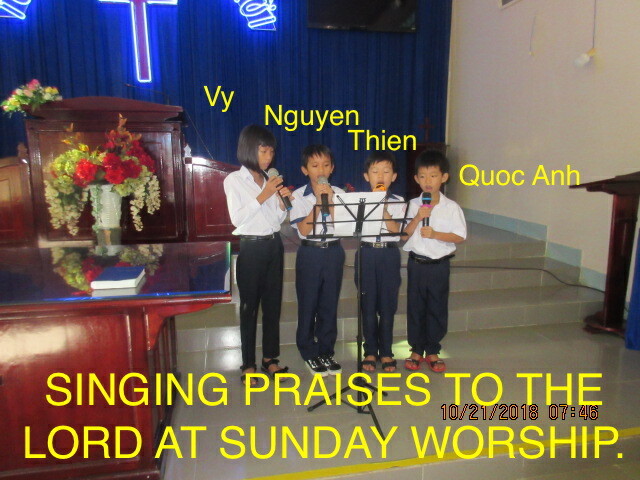 What a joy to see all 4 singing praises to the Lord during Sunday Worship (picture above). Several of the boys across the street from the church have been coming over a couple of times each week to play on our soccer field. God gave Mai the opportunity to share Jesus with 4 of them (picture above) & all prayed to ask Jesus into their heart. Please pray God will water the seed planted in them. One of our prayers has been for God to raise up more youth leaders as several of ours have graduated from high school and are now in college or working in Saigon. God has answered our prayer in Lan. God has given her a gift of prayer and a deep understanding of His Word. 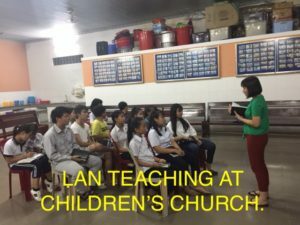 Lan has agreed to help teach the older kids class at Children’s Church (picture above). We have an issue with our well at the church and we need to have another one dug at a cost of $1,100. Please pray for God’s provision. If God puts it your heart to help with this need, please donate thru our website (jesusinvietnam.com.). We so appreciate any amount donated to help. We met a pastor (Tuan) 3 weeks ago that might be a candidate as our Pastor. Please pray God will give us wisdom/ discernment/clarity as we get to know each other ‘s heart to serve the Lord. Please pray for a new Christian (Thuy) that God will use him to bring his wife and 4 children to the Lord.